The following five guys have left Dirk, Lee, Zeebo, and even the Manimal in the dust so far this February. Find out who they are. The Bucks have been on a slump, winning just 2 of their last 10, but nobody can lay the blame on Ilyasova, who seems to have regained the mojo that made him a great Fantasy pick-up last year. The Turkish Delight is pretty much being a monster for Milwaukee, doing practically everything a 4 should do, and then some – look at his three-point percentage for heaven’s sake! Ersan Ilyasova is a stat-demon once again! With these numbers, Nene has the distinction of being the best big man on a team with less than 20 wins. Well, outside of Nikola Vucevic at least. The Brazilian has been a bona fide stat-stuffer in his last five games, and he’s also been making 60% of his shots! Of course, not even those numbers will be enough to tow the Wizards into any level of significance. The Blazers have dropped to 12th in the West thanks to a miserable February – they’ve lost 8 of their last 10. Aldridge has been his usual dependable self, however, at least in terms of offense. He’s still not exactly the most consistent double-double threat, but he makes up for his rebounding deficiencies with his brilliance from the free throw line. The All-Star Starter has brought his A-Game into February, and the Clippers are loving every bit of it. After a shaky 0-3 start to the Love Month, this LA team has racked up 5 wins in its last 7. OKC and SAS are still way ahead of them, but at least the Clippers are still on pace for a first round homecourt edge in the Playoffs. I also have a feeling Griffin will keep on getting better as the season runs its course. Every other PF out there should be cringing at that thought. J-Smoove’s numbers, when rounded up, are the following – 22 points, 10 boards, and 7 assists per game along with making more than half of all his field goals, including threes. Damn. How was he NOT an All-Star again? Too bad the Hawks are not going beyond the second round of the Playoffs, if at all, and too bad they’ll lose Smith when the free agency wars heat up. Oh well, I guess there’s hardly any better way to say goodbye (or good riddance?). Charlotte, NC (Sports Network) - Taj Gibson scored 17 points off the bench as the Chicago Bulls defeated the Charlotte Bobcats, 105-75, on Friday at Time Warner Cable Arena. Gibson, one of eight Bulls to score in double-digits, was 8-of-11 from the field for Chicago, which came into the game off a loss against Miami on Thursday. Luol Deng had 14 points and five rebounds, while Nate Robinson, Jimmy Butler and Marco Belinelli scored 12 points apiece. Carlos Boozer recorded a double-double with 10 points and 10 rebounds. Kemba Walker had a game-high 27 points for the Bobcats, who lost their second straight and 10 of their past 12 games. Walker was 9-of-17 from the field, including 4-of-6 from behind the arc. Indianapolis, IN (Sports Network) - David West posted team-highs of 18 points and eight rebounds as the Indiana Pacers cruised to another blowout victory, this time crushing the Detroit Pistons, 114-82, at Bankers Life Fieldhouse. The Pacers have won eight of their last 10 and have taken their last three by a combined 90 points, including a 34-point win over the Knicks on Wednesday. Indiana passed New York in the Eastern Conference standings on Friday and sits alone in second place behind the Miami Heat. All five Indiana starters scored in double figures, while rookie reserve Orlando Johnson netted all 14 of his points in the first half. The Central Division leaders shot 56 percent from the floor, held Detroit to 35 percent shooting and led by as many as 43 points. Detroit had four players finish with double-digit scoring efforts, as Will Bynum led the way with 17 points. Toronto, ON (Sports Network) - Rudy Gay scored 26 of his season-high 32 points during the second half in his most prolific performance in a Toronto uniform, and the Raptors hung on down the stretch for a 100-98 victory over the sputtering New York Knicks at Air Canada Centre. DeMar DeRozan chipped in 18 points and Kyle Lowry had 15 along with seven assists for the resurgent Raptors, who are winners in six of their last seven outings and are 7-3 since acquiring Gay from the Memphis Grizzlies on Jan. 30. Carmelo Anthony matched Gay with a 32-point effort and helped rally the Knicks back from a 13-point third-quarter deficit to grab a two-point lead with six minutes to go, but Lowry hit a clutch jumper with 28 seconds left to snap a 95-95 tie and the Raptors held on. The defeat was New York's fourth in a row, its longest losing streak since a six-game skid last March that triggered the dismissal of then- head coach Mike D'Antoni. J.R. Smith and Amar'e Stoudemire finished with 19 and 14 points, respectively, for the Knicks. Washington, DC (Sports Network) - Bradley Beal and Emeka Okafor led seven Washington players in double-figures as the Wizards used a balanced attack to take down the struggling Denver Nuggets, 119-113, on Friday at Verizon Center. Beal and Okafor each netted 17 points, while Okafor grabbed 13 rebounds and Beal had 12 boards and four assists for the Wizards, who snapped a two-game losing streak. Trevor Ariza and Martell Webster scored 16 and 15 points, respectively, while John Wall added a double-double with 14 points and 10 assists in the victory. Ty Lawson had a game-high 27 points and 12 assists and Wilson Chandler registered 22 points for the Nuggets, who have lost four of their last five games. 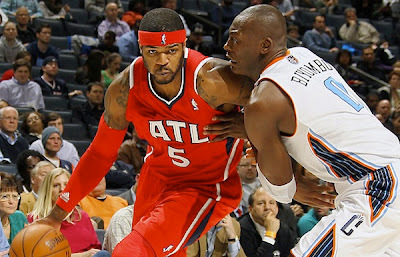 Atlanta, GA (Sports Network) - Josh Smith remained a member of the Hawks after the trade deadline and had 18 points in Atlanta's 122-108 victory over the Sacramento Kings on Friday. Smith was expected to be the biggest chip moved on Thursday. However, Atlanta decided to keep him as the 3 p.m. deadline passed. The Hawks did make a pair of minor moves, shipping Anthony Morrow to the Dallas Mavericks in exchange for Dahntay Jones and acquiring Jeremy Tyler and cash considerations from the Golden State Warriors for future draft considerations. Jeff Teague had 20 points and 12 assists for the Hawks, who have won 10 in a row against Sacramento. Al Horford and DeShawn Stevenson tallied 24 and 17 points, respectively. DeMarcus Cousins ended with 26 points and 13 rebounds for the Kings, who have lost four straight. Isaiah Thomas donated 30 points and nine assists. Josh Smith is a man on a mission for the Atlanta Hawks. Brooklyn, NY (Sports Network) - James Harden and Carlos Delfino paced the Rockets with 22 points apiece and Houston continued its recent dominance over the Nets with a 106-96 victory at Barclays Center on Friday. The Rockets were deadly from 3-point range, especially Harden and Delfino, who combined for 10 of Houston's 16 makes from long distance and each nailed one down the stretch to seal the victory. Omer Asik compiled a double-double with 10 points and 11 rebounds in the triumph. Brooklyn had its four-game winning streak halted as they dropped a 13th consecutive game to the Rockets. Brook Lopez tallied a game-high 27 points for the Nets, while Deron Williams added 15 points with 13 assists in the setback. C.J. Watson scored 17 points in a starting role for Brooklyn, as Joe Johnson missed his first game of the season while battling plantar fasciitis in his heel. Memphis, TN (Sports Network) - Marc Gasol and Zach Randolph each recorded double-doubles and the Memphis Grizzlies earned their sixth straight win with an 88-82 decision over the short-handed Orlando Magic. Gasol finished with 19 points and 13 rebounds, while Randolph chipped in 16 and 14 for Memphis, which won the battle in the paint, 40-32 and had 12 more fastbreak points. The Magic will almost surely miss the playoffs for the first time in seven seasons, forcing them to build for the future at Thursday's trade deadline by dealing sharpshooter J.J. Redick to the Milwaukee Bucks. The three players Orlando received in the six-player deal -- Beno Udrih, Doron Lamb and Tobias Harris -- as well as Hakim Warrick, who was acquired from the Bobcats, were not available Friday, leaving the Magic with seven healthy bodies. New Orleans, LA (Sports Network) - Dirk Nowitzki registered 25 points and seven rebounds, leading the Dallas Mavericks to a 104-100 win over the New Orleans Hornets on Friday. Nowitzki was 10-of-17 from the field for the Mavericks, who have won three straight games. Vince Carter recorded 22 points and nine rebounds off the bench and Elton Brand added 13 points. Eric Gordon and Jason Smith scored 23 and 22 points, respectively, for the Hornets, who have lost three straight games. Ryan Anderson recorded a double-double with 20 points and 12 rebounds, as did Anthony Davis, who had 10 points and 11 rebounds. Oklahoma City, OK (Sports Network) - Russell Westbrook amassed a season-high 37 points and Kevin Durant added 27 as the Oklahoma City Thunder got back on track with a 127-111 victory over the Minnesota Timberwolves at Chesapeake Energy Arena. Westbrook made good on 13-of-22 field goal attempts to go along with nine assists and seven rebounds in a terrific all-around display that helped the Northwest Division leaders halt a season-long three-game losing streak. Kevin Martin contributed 19 points off the bench for the Thunder, who shot a sharp 57.8 percent from the floor and finished a perfect 22-of-22 from the foul line. Alexey Shved paced seven Minnesota players in double figures with 17 points, but the Timberwolves failed to build off Wednesday's home win over Philadelphia in their first outing after the All-Star break. Andrei Kirilenko and Dante Cunningham each registered 15 points in defeat, with Ricky Rubio compiling 13 points and nine assists for Minnesota. Phoenix, AZ (Sports Network) - Jeff Green had a game-high 31 points on 11- of-14 shooting to go along with seven rebounds, four assists and five blocks, as the Boston Celtics downed the Phoenix Suns, 113-88, picking up their first road win in eight tries versus Western Conference foes this season. Chris Wilcox had 14 points and eight boards for the Celtics, who picked up their first victory following the All-Star break en route to snapping a two-game skid. Avery Bradley and Jason Terry each scored 13 points and newly-acquired Jordan Crawford donated 10 in the victory. Goran Dragic totaled 19 points and 10 assists for the Suns, who have lost two straight and six of their last seven games overall. Markieff Morris scored 11 points and Marcin Gortat registered 10 in the setback. Los Angeles, CA (Sports Network) - Kobe Bryant, who thinks the Lakers will make the playoffs, scored 40 points in Los Angeles' 111-107 victory over the Portland Trail Blazers on Friday. Bryant said in an interview with Sports Illustrated that he is certain the Lakers will make the playoffs. The 15-time All-Star also claimed he has "no fear" of any potential postseason opponent in the competitive Western Conference. The 34-year-old Bryant added seven rebounds and two steals for the Lakers, who have won seven of 10 and sit 3 1/2 games behind the Houston Rockets for the eighth spot in the conference standings. Dwight Howard tallied 19 points and 16 boards for Los Angeles, which has won six straight home games against Portland. Antawn Jamison had 16 points. J.J. Hickson ended with 22 points and 11 rebounds for the Blazers, who have lost seven in a row. Nicolas Batum and Damian Lillard added 22 and 19 points, respectively.